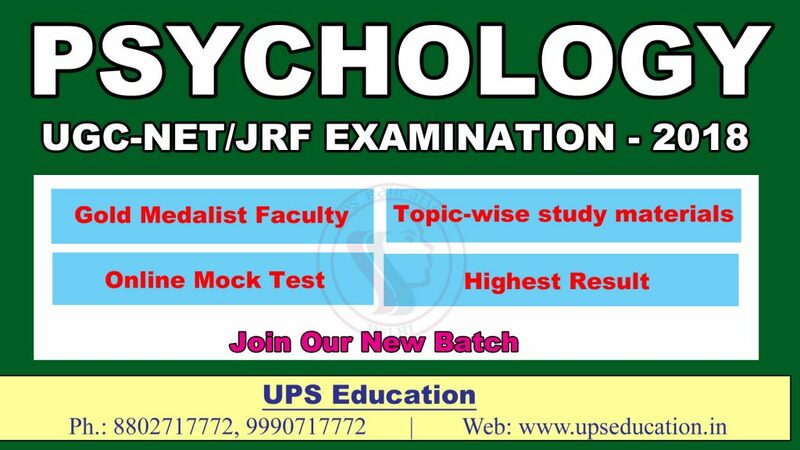 UPS Education is India’s no.1 UGC-NET/JRF Psychology Coaching in India; our attractive results and well Educated (Gold Medalist) faculties are the key of our success. We provide both regular classes as well as Distance Learning Mode Coaching for UGC NET JRF Psychology Exams. Apart from the regular classes we also received very positive results from our Distance Learning Mode Coaching. We revise our material after the every UGC NET JRF Exam and analysis them according to current exam pattern and syllabus. Which make our study materials unique and different from the others. This entry was posted in Best CBSE NET Psychology Best CBSE NET Psychology, Best NET Psychology Coaching in Delhi, CBSE NET JRF Psychology Coaching, CBSE NET Psychology Coaching, NET JRF Psychology, NET JRF Psychology Coaching, NET Psychology, NET Psychology Coaching, NET Psychology Coaching in Delhi, UGC NET Psychology, UGC NET Psychology Coaching and tagged psychology net coaching, UGC-NET Psychology Study Materials on January 8, 2018 by UPS Education.